So like I was saying in my earlier post, I managed to get a pretty-much full tour of the Fletcher-class destroyer USS Cassin Young last Saturday. I took a lot of pictures. While still on deck, I took some pictures of the ship’s weapon systems. The 5 inch guns were in the last post, so here are the rest, starting with the 40 mm antiaircraft guns. These quad-mounts replaced the original dual-mounts sometime after the war. They would have been more useful had they been installed sooner. By late 1944 and early 1945 you just couldn’t get enough antiaircraft weapons on Navy ships in the Pacific. 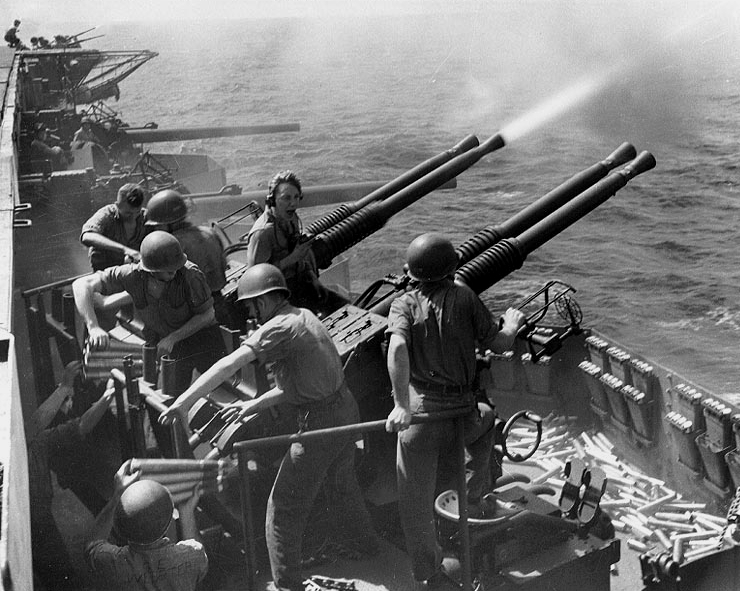 After the Navy realized that the types of antiaircraft weapons they had in 1941 and 1942 (usually water-cooled .50 caliber machineguns, 1.1 inch “Chicago Pianos”, as well as open-mount guns in 3″, 4″, and 5″) were totally inadequate, they began to replace them with the 20mm Oerlikon and 40 mm Bofors. The Bofors in particular was such a spectacularly successful system that some are actually still in active military service around the world. The Bofors was, essentially, a gigantic machinegun. 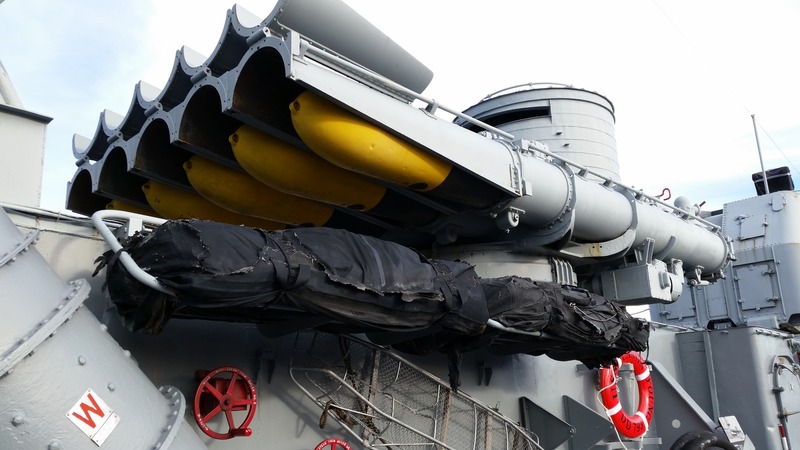 The water-cooled versions adopted by the US Navy (usually in dual or quadruple mounts) could fire up to 160 rounds per minute, per barrel. The ammunition was inserted into the weapon in 4 round clips, and so going full-tilt those mounts must have been a hell of a sight. So for a quadruple mount like the one seen below, the crew would consist of a gun captain (the guy with the headphones), a pointer, a trainer, and eight loaders. So many loaders were needed that when General Quarters was sounded, men whose normal jobs on the ship had nothing to do with combat – cooks, stewards, clerks – would find themselves as loaders somewhere on the ship. The amount of noise must have been incredible. No wonder that one guy is screaming to make himself heard. So imagine, if you will, the tremendous racket that must have taken place during air attacks. When built the Cassin Young had 5 twin mounts of 40mm guns and 7 of the 20mm guns. It may sound like a lot, but not when compared to a ship like the USS Massachusetts, the South Dakota-class battleship that Kelly’s grandfather served on. The “Big Mamie” would eventually carry 13 quadruple mounts of the Bofors and 35 single mounts of the Oerlikons. And since the Cassin Young and the Massachusetts served together in Task Force 38.3 of the Third Fleet, they got to put their antiaircraft weapons to the test. And because the Internet is just freaking unbelievable, I actually found original film footage of Task Force 38.3 putting up a lot of “flak”, as antiaircraft fire was often called as they were attacked by Japanese aircraft. I can’t tell which destroyer and which battleship is in the video, but it does give you an idea of what it would have looked like. The video was taken from the carrier USS Essex. No sound, though – that’s probably for the best. 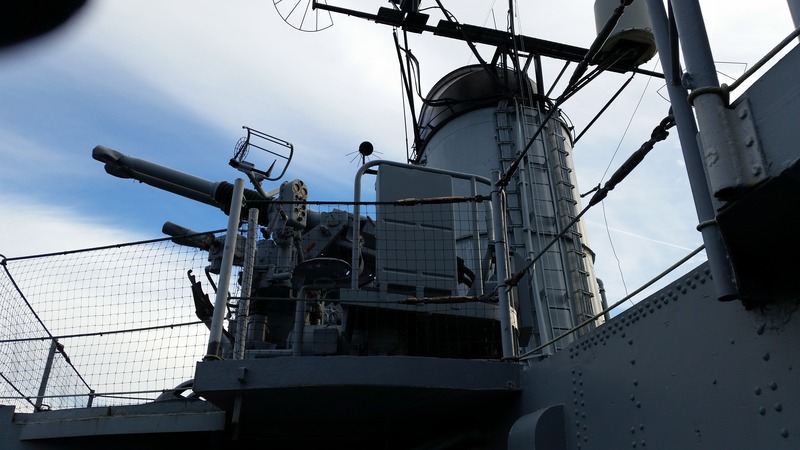 There is currently only a single 20mm Oerlikon mounted on the Cassin Young these days, and I didn’t get to take a picture because other tourists, especially teenage boys, were constantly surrounding the thing. But I did get some shots of the torpedoes. And since at one time my Great-Uncle John Speckhals was a Chief Torpedoman’s Mate (need to look up which ship he did that on, because I can’t remember) for a while, I was curious to try to understand them a little better. The sole remaining quintuple torpedo mount on the ship. Yellow warheads indicate training weapons, at least in that era. The mount had a crew of three, and all of them were crammed inside that thing that looks like a corrugated tin igloo on top of the mount. That was not armor, really, but merely an improvised stopgap designed to give the torpedo crew some protection from the muzzle blast of the 3rd 5 inch gun mount. Torpedoes were the serious ship-killing weapons of their day, typically mounted on submarines, destroyers and destroyer escorts, motor torpedo boats (think JFK’s PT 109), and sometimes on cruisers, though typically that was not done in the United States Navy. Torpedoes were a bit of a sensitive subject for the Navy in the early years of World War Two, mostly because American designs were simply not that great, not the submarine torpedoes and not the destroyer torpedoes, and unfortunately many senior officers in the Navy, especially in the Bureau of Ordnance (and one important officer in particular) refused to acknowledge that there were any problems with them. 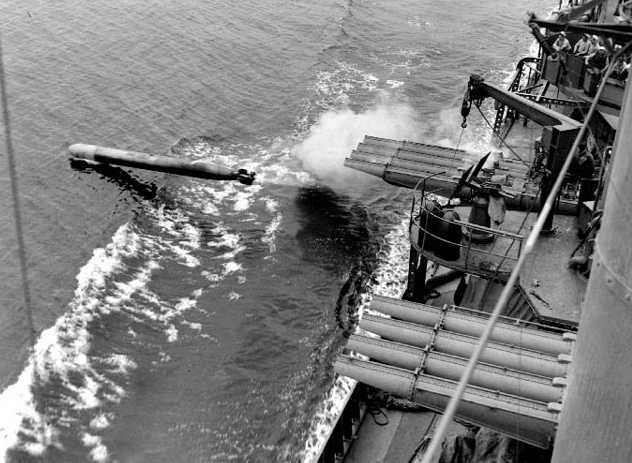 Most crews had few if any chances to even fire a practice torpedo, since they had to be recovered and many crews feared losing them. But I did find this photo of a practice torpedo being fired from a destroyer, in this case the Mahan-class destroyer USS Dunlap. Hope you were able to get it back, fellas. Surprised they didn’t tie a rope to it. I would have. Once again, I have dragged out a post to be ridiculously long so I will end for now. Looks like there will be a part three.